Well the calendar says it's the first day of summer today, but I'm not feeling it here is Washington State. But...it's on it's way suppose to be in the 80's by the end of the week. That is good I have a ton of weeds to pull. 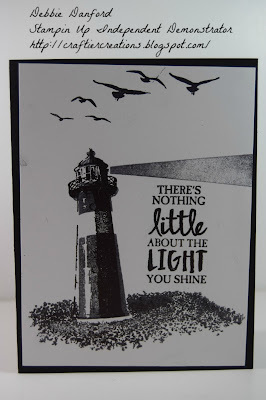 On to my 2nd set of card from the Stampin' Palooza. I have to admit until Michaela presented this card to all of us, I had not bought this set. Just not one that thrilled me. 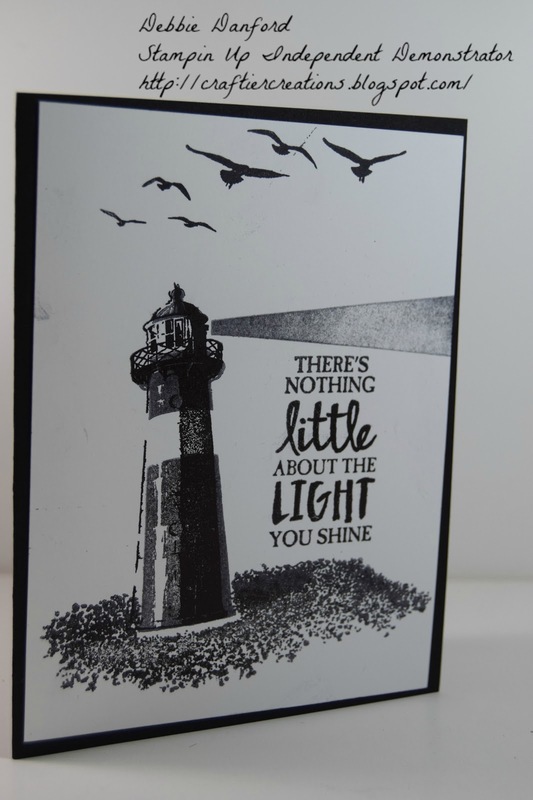 I have since used parts of it on another card.. You stamp off almost every stamp first except the birds, the detail light house & the phrase. So quick & easy & you could use so many different color combos with this. Fold pre-scored body of card, first in half then flip half back again as indicated by sample. 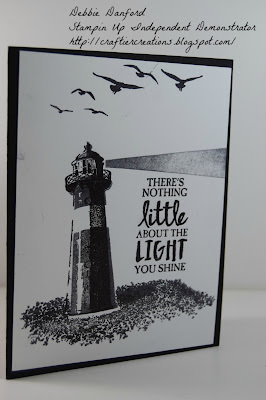 Stamp small balloon with Versa Mark on the Whisper White & heat emboss with white embossing powder. Stamp the small & large balloon on scrap with Versa Mark & heat emboss with white embossing powder. Stamp clouds with Island Indigo on scrap. Die cut balloons & clouds. Sponge the background of the Wisper White with Soft Sky on the bottom, Calypso Coral in the middle (sunset affect) & Island Indigo at the top. Keep in mind Island Indigo can be very dark, so sponge off a little on scrap first. You can always add more ink, but you can’t take it off. Sponge the large balloon with Calypso Coral & Soft Sky on the basket. 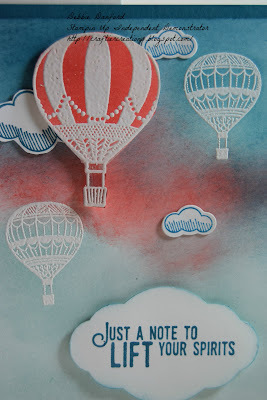 Attach clouds with glue dots & large balloon with dimensionals. 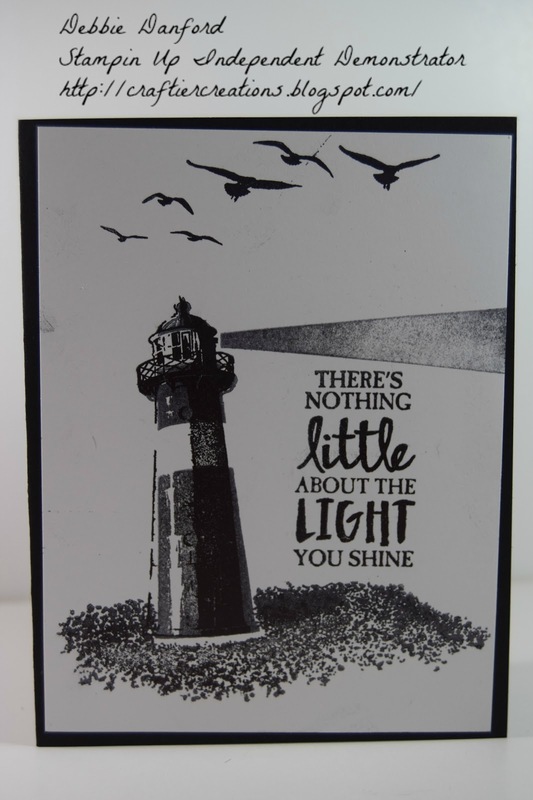 Stamp phrase with Island Indigo & punch out with Pretty Label Punch. Sponge around the edge with Island Indigo, attach with dimensionals. Attach to Island Indigo piece. Attach to Z-fold card base. Remember to only tape the edge of the card.